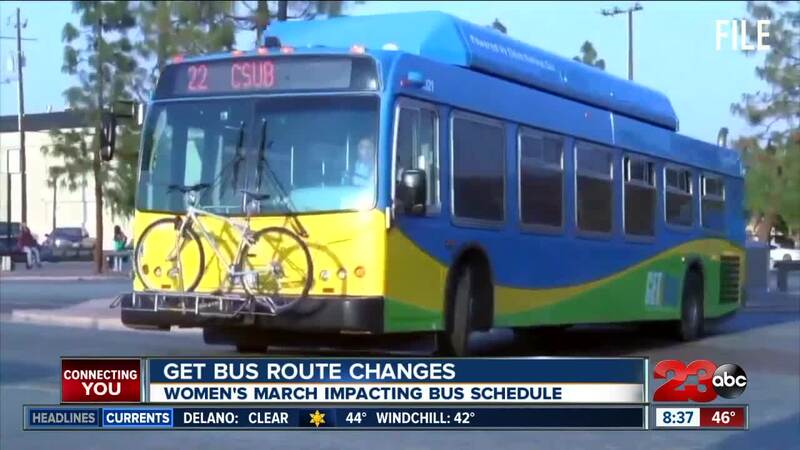 Saturday's Women's March caused some traffic and other delays in Downtown Bakersfield including changing the GET Bus routes. BAKERSFIELD, Calif. — The Golden Empire Transit had to reroute one of their bus lines Saturday due to the Women's March in Downtown Bakersfield. The Women's March was scheduled to start at Central Park and continue through the downtown streets before returning to Central Park. That march route directly impacted one of the GET Bus' lines. For more information about the GET Bus route changes for Saturday, visit their Facebook page .